Instagram is the fastest growing social network at the moment, with 400 million active users and 15 times more engagement than Facebook. If you don’t have an account get one, and you will understand why Instagram is so popular. It is fun and very visual; the interface is simple to use: Upload the picture, like them, comment on the photos and follow other users. Although Instagram has a website, it was made for mobile phones. Utilising the camera that every smartphone now has along with a collection of fun filters, Instagram lets everyone feel like the artist/photographer they dream of being. Don’t believe me? Take a look at my account (http://instagram.com/vacaseca/). Instagram is ideal for brand recognition, lots of big brands are on Instagram because of that reason: Coca-cola, Macy’s, Nike and Red Bull to name a few. If you can come up with excellent imagery from your business, you will have an easy time on Instagram and people will engage with you through the pictures you share. For some companies the product/service they offer is more abstract, this is when you need to get creative with the photos your upload. For example, some experts advice sharing images of the people that work for your company. Just like on the other social networks, quality content rises to the top, and on Instagram, the material is pictured. Most people have an emotional connection when they look at a photo, and this increases with better quality pictures. The potential to engage your audience is just one picture away; start a conversation with your followers. Unlike other social networks, you can’t share links back to your website, at least not clickable URLs. 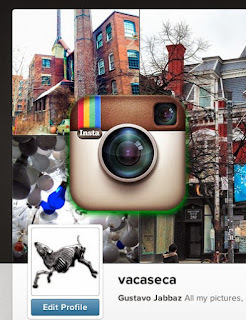 What is clickable on Instagram are hashtags (use them wisely) and account handles (mine: @vacaseca). When you tap (most likely you will be on your phone when this happens) on the take care of it takes you to the account profile. On your account profile is where you get to have a link to your website or the page you want people coming from Instagram to land. Keep in mind this will happen on the phone, so this page (or site) needs to be mobile ready. This link, as with the other information in your profile, can be edited at any time, just make sure it is complete and up-to-date. The use of hashtags is one way to reach people outside your followers; there are a few hashtags that are very popular such as #love #food #instadaily #photooftheday #amazing #smile #look #instalike #picoftheday #iphoneonly #instagood #bestoftheday #instacool #instago. These are a few examples and may or may not work with the audience you are trying to reach; best is to try a couple at a time and see the results. Another way is to search for accounts that are in the same industry and look at what they are using. My experience with building followers is to like pictures and interact with the people you want to follow you. There more you do this; the more followers you will gain. Needless to say, you need to have good pictures for people who want to follow your account. Post pictures often, but not so often that you fill people's feed with your images. Choose 2 to 3 good photos per day and space them out throughout the day. Try different times of the day and see what works best. Add a comment and hashtags to your post, but don’t abuse either one of them. Keep the comment short (no more than a couple of lines) and use no more than 4 to 5 hashtags. You can also tag people on your pictures, and they will get notified, again use with caution you don’t want them to get annoyed and stop following you. Instagram is a great network to engage with your audience, and there are many tools to make it easier for you to manage your account and track your success. Instagram Tools for Business: Nitrogram (http://nitrogr.am/), IconoSquare (http://iconosquare.com/), WebStat (http://web.stagram.com/) to name a few. The truth is if your business is B2B you could make it work, but you will need to invest a lot more effort than you do for other social networks for better results. Instagram is perfect for companies with tangible products, restaurants, music labels, florists and any business that can share great pictures of their products and services. Hey Gustavo. I'm happy I took a few minutes this morning to read your post; Very good advice & great pictures! Glad you like the post and pictures Arthur. I try to post every week you can join the email list and get the weekly updates right to you inbox.